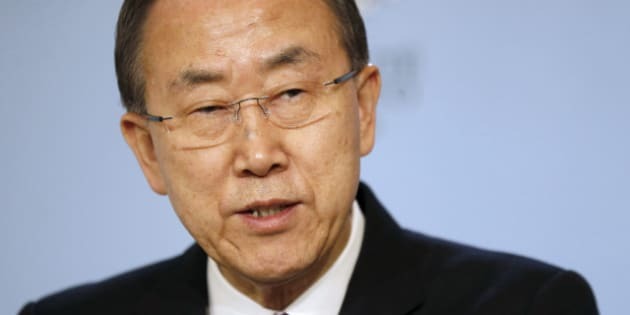 Ban Ki-moon told CBC on Thursday that Canada needs to stop stalling on setting climate change goals, and instead become "ambitious and visionary." The UN Secretary General, while acknowledging the Stephen Harper government pledged $300 million dollars to the UN&apos;s Green Climate Fund that helps developing countries fight climate change, said there&apos;s more to be done by Canada at home. "It&apos;s only natural that Canada as one of the G7 countries should take a leadership role," he said in an interview with Peter Mansbridge of The National. Part of that change would involve moving away from a reliance on fossil fuels. "There are ways to make a transformative change from a fossil fuel-based economy to a climate-resilient economy by investing wisely in renewable energy choices," he said. According to the recent 2014 Climate Change Performance Index, a report from European groups Climate Action Network Europe and Germanwatch, only Australia rivals Canada in terms of its poor climate change record, among 34 countries analyzed. Ban said there&apos;s additional pressure for Canada to act in the wake of the recent deal between the U.S. and China to cut greenhouse gas emissions by 2025. UN Climate Change Conference talks are ongoing in Lima. Watch the full report, with comment from Canada&apos;s Federal Environment Minister Leona Aglukkaq. You can also watch the At Issue panel debate the secretary general&apos;s comments here.